Change of plans tonight. Was going to drop a dope electro jam, but that'll wait. Lil' Wayne's new single off Tha Carter IV leaked today. Wayne has an elephant sized presence in my iTunes and I've been a Lil' Wayne fan since way back in the day when me and my buddy Quon would ride around on our bikes listening to his debut Tha Block Is Hot. Probably the best album ever put out by a 16-17 year old, his debut set the tone for years of hard hitting albums and mixtapes. While his albums seemed to sometimes put constraints on Wayne, his zaniness always found its way onto his countless mixtapes (I still think Tha Drought III is the best mixtape of all time). With his Tha Carter series, Wayne solidified himself as a serious artist, and his Tha Carter III album was one of the most successful albums of this past decade. 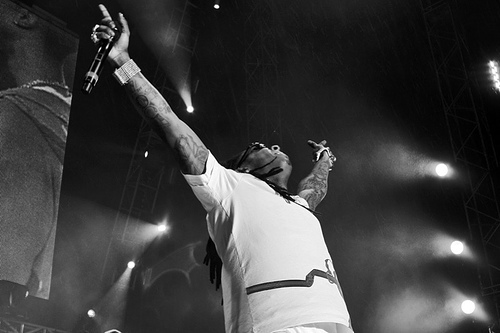 Wayne's combination of punch lines, raw energy, word play, and the undeniable "it" factor have made him one of the most popular rap artists in the world. A recent jail stint though had people wondering what was the next step with Wayne, especially after his last two eh releases (Rebirth and I Am Not A Human Being). This street single seems to answer every question and doubt. Picking up right where "A Milli" left off, Weezy comes out throwing JaMarcus Russell fastballs. Wayne started writing his rhymes for the first time in jail, and although far from the lyrical precision of Rakim in our last jamandahalf, he makes up for it with a swag that seems to be at an all time high. With lines like: "real G's move in silence like lasagna," and "I got through that sentence like a subject and a predicate" Weezy seems like he's fully back, having fun, and out to prove that the jail sentence was nothing but a hiccup in his over 13 year old career. Welcome home.